Narcissistic Personality Disorder and Sociopathy are becoming detrimental to kind empathic people. Learn, Expose and Fight Back against this evil!! Beware Of Narcissists and Sociopaths! It is no surprise that there is a growing number of sociopaths and narcissists in our current world. Our whole system breeds more and more of them each day through the fundamentals of capitalism, socialism, and of course social media is an absolute breeding ground for psychopathic behavior that requires no empathy at all. Billions of interactions happening everyday on the internet and no feeling or emotion is needed to convey all of these messages. It is a dream set-up for those who have no empathy or care for others, and they use it each and every day to prey on good people. And this certainly does not only occur on the internet, I am just saying that is the reason for the rapid growth of psychopathic behavior in society. The individuals who have sprung from this are affecting people all around the globe each day, and because much of the behavior is covert and well planned out by 'intelligent' people, abuse continues to grow for the empaths and good people of the world. We are being preyed upon daily and most of the time have no idea it is even happening until it is often too late. Being abused by someone with a narcissistic personality disorder or a sociopath, especially over a long period of time, leaves the victim scarred and empty. The victim has been abused for so long that all they can do is try to get away from their abuser, because we are left with very little energy for anything else, and if you try to fight back against the wrong-doer, they have already been carefully crafting lies and deceit behind your back which makes fighting near impossible. We all have these people in our lives but very few can recognize them. They walk amongst us as seemingly normal and friendly people, but they will stab you in the back at a moments notice, and have no remorse for their actions whatsoever. They are often even revered in our communities because you only get to see their surface and they are very clever at presenting themselves well to others, and act as chameleons who will shift their behavior based on self-gain. I am personally tired of being abused by these 'less than human' beings and have been studying for years about how to recognize them. Although I am highly knowledgeable about what to look for I still get fooled by the more clever ones myself. I had a thought yesterday that helped me put the recognition into a simpler perspective. 'A Narcissist will always tell you what you WANT to hear, whereas an empath (good and caring person) will always tell you what you need to hear!' If someone is always flattering you and telling you what you want to hear, be wary of this person and do more research before freely giving away your trust. If someone is telling you what you need to hear, they likely care about you and are trying to be honest. It is so much easier to love the narcissist because they know exactly how to stroke your ego. Here is my point; we lock people up in jails and prisons every single day for physically abusing others, so why are we not locking people up for abusing people emotionally, and knowingly. In my opinion, these are the most evil and destructive people on the planet because they can not even face you head on. I am against physical abuse of any kind but it is easier to get over the physical problems than the trauma they create. We all know what differing types of trauma can do to an individual, so why are we allowing predators to continue their abusive emotional behavior? Because it is so much harder to prove when we can not physically see the evidence, this is why narcissists and sociopaths use this form of abuse. On top of that, the victim ends up so emotionally drained that there is no fight left in them. I guarantee that most of you deal with these types of people on a daily basis and have not recognized them yet, but you can sense that something is wrong. Explore your senses and look deeper. Do a little reading about narcissists on the internet or join one of the many supports groups on Facebook and educate yourself. There are thousands, if not millions, of people on the net talking about this and looking for abuse support. This is a problem of epidemic proportions and the only way to overcome it is through awareness and exposure. Stop letting these 'less than human' beings abuse others by taking a stand. If you feel that something is wrong, then there probably is, but don't stop there. Take action and learn the signs to protect yourself. Take it from someone who has been abused long-term more than once, it will take its toll on you and cause a decline in your health. Arm yourself with knowledge and expose these individuals for the abusers that they are. Don't let them get away with their inhumane behavior anymore. Hard times in life can cause much pain, but they also force us into a self-reflective state. The great 'ego awakening' that is occurring in the world is happening, and this evolutionary upgrade is forcing everyone into self-reflection whether we like it or not. Self-reflection is the path to our inner self, but our ego will resist at every corner. After a time of personal self-reflection my personal goals have shifted into a more forward way of thinking once again. I have been hoping to help others with mental health issues in the same way that society is. I am learning that although counseling, therapy, medications and other medical help is easing the suffering of many, it is still just a 'band-aid' solution, and the system just keeps looking for more bandages instead of going to the source of the issues. Just like when a part stops working on your car it must be fixed in order to have it operating in an optimal state. Problems in our minds need to be repaired in the same way. We cannot simply work backwards in the hopes that we will find the source, and hope that by doing so that we have fixed the problem. We can use psychotherapy and other forms of therapy to find the sources of our mental issues, but the problem still needs to be fixed. And the problems are all in the same place, no matter who you are! All of our problems stem from the same place, our 'self'. Every problem we have is based within our perception and not with the perceived problem itself. The only way to stop the mental health epidemic we are faced with right now is to fix the source of it all. If we begin to find ways to fix our 'self' then everything else will fall into place. I had a discussion/argument with a narcissist once about how to truly help people fix their inner issues. I was faced with the argument that we need to appear to be on the outside, who we want to be on the inside and therefore the only way to help someone improve their state of being is to work from the outside in. This was a profound discovery for me because I had learned how completely messed up a person's way of thinking can be, and these people are thriving in our dysfunctional society. The only way to help someone in this way is to start with their 'self', because without that, we are nothing. Anyone who wants to be a better human has only one starting point, but getting in touch with our inner self is certainly not an easy task, especially when there are so many distractions around us at all times. For years I have been researching philosophy and religions in the hopes that I would find some words or a simple premise to truly believe in. Most of the philosophies I have studied are quite sound but the religions I have read all have similar issues at their base. Any religion that is based in the betterment of human existence and wellness, I hope it will thrive in this new world. If it based in power and control of their followers I wish them no harm, but I do know that those ones will fall apart on their own. Karma has a way of doing that. I have decided that I will move forward with the words of someone I believe to be one of the only truly enlightened beings on our planet at this time, Mr. Eckhart Tolle. Through enlightenment and becoming completely awake, he has shared his path and journey to his greater understanding. If you have every read his books you can easily see that the words come from an enlightened individual. Many people have a hard time understanding his books because they have never been where he is now. You first need to find your 'self' and be at peace with your own being before the words he shares will truly make sense. If you are looking for your path to peace, the understanding of his words will certainly help you find your way. If you are someone who is experiencing the awakening process and need a little help on your journey, Eckhart's books will literally speak to your conscious mind and show you the way. If you are someone who is saying to yourself, 'I am already completely awake', that is your ego speaking and it loves to play games of illusion because that is all it has. Tell it to be quiet because you are not fully awake at this time, I guarantee it. If you were, your inner self would already be at peace and your ego would not be able to keep creeping into your thoughts. Remember that you are not the 'thinker', you are the stillness that is watching the thinker. This statement alone will awaken something within you right now that you may not recognize, but this is the self you are searching for. As I am finding my own peace once again I can feel enlightenment right in front me, just out of reach. 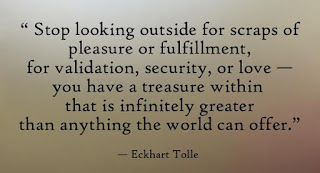 I am re-reading Eckhart Tolle's books currently for the 'umpteenth' time in order to knock down my last couple of barriers. I plan to blog about this as much as possible over the next few weeks to sort out some of the words I am reading. Some of the explanations and words in his books can be difficult to understand for many, which I have learned from being part of a few discussion groups on Facebook. I will share his words in a more simplistic way so that we can all better understand what he is trying to say. 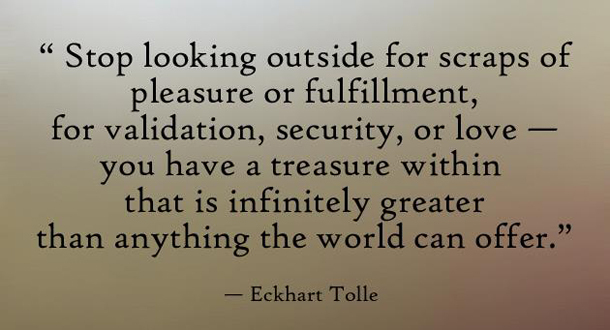 I will not attempt to call Eckhart Tolle a 'prophet' at this point, but he is one of the closest people we have on Earth right now that would fit the definition. His words are extremely important and need to be shared with all those who are trying to awaken to a better world. The faster people awaken, the better the human race will become. Many will be consumed by their egos and we can already see who those people are. This is going to be a difficult journey for us all but I do believe there is light at the end of the tunnel. Those who are recognizing ego in others are the 'awakened ones', while those who are consumed by their egos will continue to prey on the weak. Just know that the only journey for you at this point is to awaken and find your 'self'. When you find this you will finally know what peace is. Once you find peace and can learn to exist in the present moment, whatever happens simply happens at that point. Worry and anxiety disappear and your best 'self' will be ready to handle anything that is thrown at it. Have a peaceful and glorious day! Sometimes I will be reading an article and memories will pop into my head about my own past situations. Although I am able to put things in the past and leave them there for the most part now, I still have flashbacks to the abusive workplace I spent too much time in. Here is a positive thought that came to me this morning, we don't have to view all the bad memories as bad. When our perspectives change over time we can learn to view our past in a very different light. More often than not, I find myself giggling at certain memories in regards to my abusive narcissist, but the actual situations were anything but funny when they were happening. This is one of the differences of understanding subjective and objective information. Now that I have detached all emotion from my past situation, I am able to view memories in a more objective way, and some of Her (the narc) behaviours are absolutely hilarious when I look at them in another way. I was reading an article this morning about narcissists and hypocrisy. My educated guess at this point is that all those with NPD are also natural hypocrites. I can say that my narc abuser is one of the worst hypocrites I have ever met. I used to write down a word of the day for my students on a whiteboard, and we would talk about each one to promote intelligent discussion, and to improve vocabulary. One word I left on the board for a few weeks near the end of my time there, was hypocrisy. The funniest part is that the Narc had no idea that it was left there so others could discuss Her behaviour in a more open way. The memory I had this morning made me chuckle for a bit so i thought I would share. It is not the punch line of a joke, BUT it will add another example of tactics Narcs will use to keep you off balance. We worked in a very small 'schoolroom' atmosphere, yet we used to get the dumbest memos, even when we were only a few feet away from each other. One day we got the first memo, and there was list of words and phrases that we were no longer allowed to use in the building, because to her, they were not 'proper'. Personally, i would get snapped at every time I used the phrase 'you guys'. I mean She would literally get downright mad at me. Remember, I am an intelligent man in my forties being treated like a child at this point. Ahh, one of the Narc tactics. The one that made me giggle was the day we were told not to use the word BUT anymore, and that we were to find ways to change the way we speak and write so that this word would be used no longer in the building. Not 2 hours later, we received another memo about something totally different, and I counted 3 BUTs in the short memo. When I brought this to the attention of the Narc, I was told that she used it the proper way so it was okay for her to do so, BUT we are not to use it. I think I just defined the word Hypocrisy for you all right there. I share this example so you can see another simple tactic used by narcs. 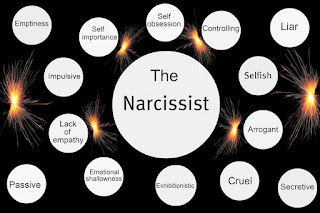 People outside of the circle don't ever see the how messed up the narc is because there is not just one thing that they do that makes them a narcissist. It is not like there is a sign on their forehead telling you they are evil, they use a bunch of little things to erode and tear you down slowly and painfully. Hypocrisy is just another tool they use to keep you off balance and out of control. The more you educate yourself and the more you remain objective, the easier it is to identify a narcissist when you encounter one. They will prey on your subjectivity constantly, and will do everything they can to keep you from ever being objective, because once you have viewed their true behaviours objectively, they can no longer fool you. And that is when they will dispose of you! They will find a new supply, and this cycle never stops for the narc, they will not change. Are all narcissists hypocrites? A lot of the research would point to yes, but there is no definitive research that can simply say yes. 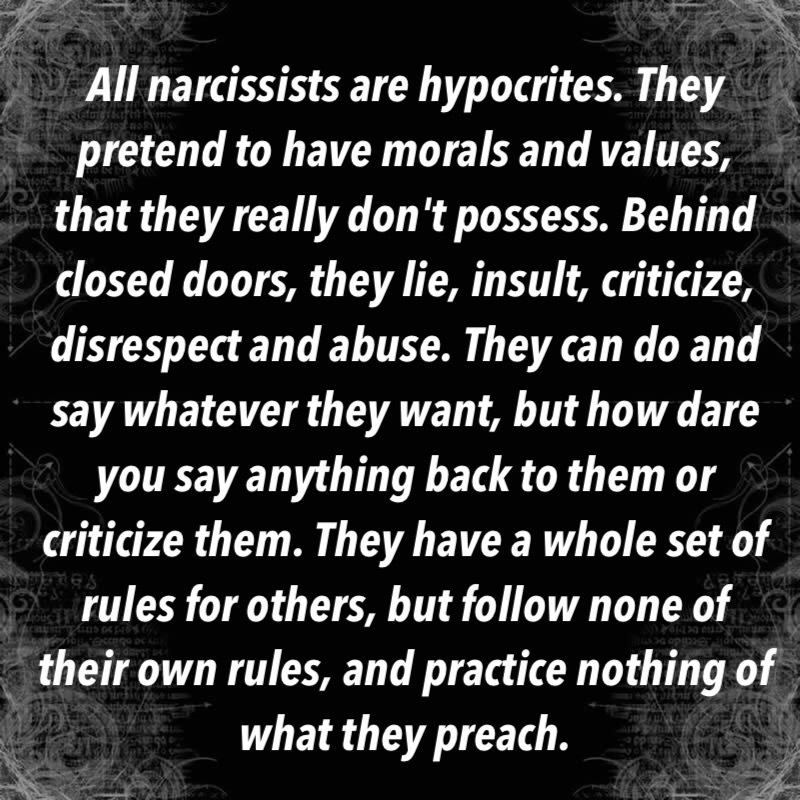 I have not met a narc who is not a hypocrite personally, and I would theorize that all narcs are hypocrites though. It is a tool that can be used to create imbalance in the victim, and narcs come well-armed with these types of tools. 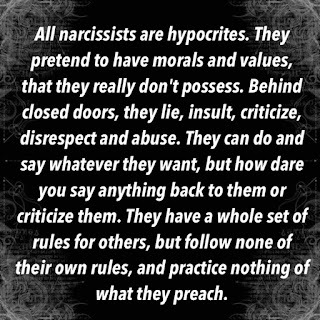 When you see someone being hypocritical, look for other narc factors that you may find in the DSM, and there is good chance that you have spotted a narc. I also know all the current research states No Contact as the best way to deal with Narc Abuse, BUT I also know that there comes a time when someone must fight back. Start learning about your abuser/enemy so that you can eventually find a way to stop them. I guarantee it will make you feel much better, BUT make sure you are very careful, in a good place mentally, and that you know your enemy very well first. Once you do, help others by putting a stop to them. I know this part is easier said than done, BUT we can certainly try our best and no give these narcs freedom to abuse others.